Off the Beaten Path: It's a Vlog Post!!! A Vlog Series, in Fact! It's a Vlog Post!!! A Vlog Series, in Fact! After I read Genesis 33 for the humpteen billionth time this morning something new caught my eye. In fact, several something news caught my eye. And I was so full of stuff I wanted to share with you that I thought it best to pull out the video camera and talk it out rather than type it out. Today I'm posting the first of three videos on Genesis 33:1-11. I'm offering some insights on forgiveness that might just resonate with you. So, whether you're reeling from a wounding or doing pretty well right now, I hope you'll click "play" and sit back for a few minutes. Oh, and grab your Bible. You're going to want to see these things for yourself! 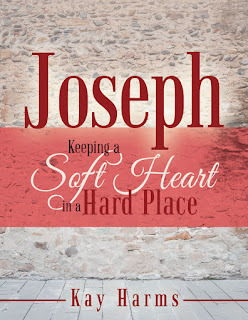 You can find more information about Joseph - Keeping a Soft Heart in a Hard Place here. What is some of the "work" of forgiveness you've done with God in order to walk in forgiveness with someone? I'd love to know.